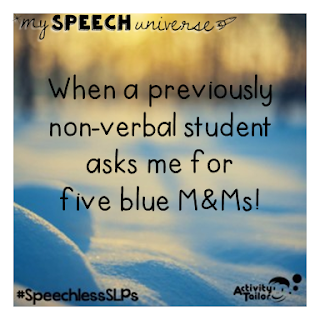 There have been many moments in my career as an SLP that have rendered me entirely speechless. When I saw this topic from Activity Tailor, I knew I had to link up! Working in self-contained Autism Spectrum Disorder (ASD) classrooms for over 12 years now has produced many speechless moments for me. My favorites are when students who were previously non-verbal or very late talkers communicate with me. When a student uses every color on their PECS book to request every color Skittle I have. When a student with ASD has been working on simple conversations for a long time, and spontaneously makes a comment without prompting. When we figure out that a completely "non-verbal" student will speak and repeat words into a microphone! When a parent cries at an IEP because they are so happy with the progress their child has made. When a student with ASD moves away for a year and a half, comes back, and still remembers my iPad password!!! There are many speechless moments with my students that are not in self-contained rooms too. When my kindergarten friends across the hall make sure to come and get me any time they are starting "my song." Pop See Ko 2.0 You have to check this one out! This will seriously get stuck in your head!!! When a parent tells me that their child's grandparents can now understand them on the phone. When six first grade friends want to come with me to my room when I pick up one of their classmates, and the student coming with me looks so proud that she gets to go. Of course there are many moments at home too! When my seven year old son still wants me to "smush his cheeks" every morning. When the same seven year old tells me "good night, sweet dreams, see you in the morning" every night before I shut his door. When both boys come all the way across the house to find me and ask me to make a sandwich when their dad is standing in the kitchen! When my nine year old son tells me that he is sad that he will have diabetes for the rest of his life. When my husband tells me he loves me and I'm beautiful. Makes my heart beat a little faster every time. I realize every day how blessed I am to have my family, friends, and students in my life. They all make my life so full of love. Thanks to Kim at Activity Tailor for putting this linky together!